There are changes coming this season to our All Skate Program, Our new skating director will be Andy Brandt. Andy is currently the Associate Coach for St. Norbert College Men's Hockey Program. Andy Brandt, a Wausau, Wis., native, arrived at St. Norbert after spending the last two-and-a-half seasons as the head coach and general manager of the Atlanta Gladiators of the ECHL. He was also an assistant coach with the Gladiators for the 2013-14 season and into the 2014-15 season before being promoted. Brandt spent seven seasons as a professional player, mostly with the then-Gwinnett Gladiators. He appeared in a team-record 357 games, scoring 76 goals and 116 assists for 192 points. Brandt was an assistant captain from 2007-12 before serving as the team captain in 2012-13. Brandt also played in the AHL for the Lake Erie Monsters, Manitoba Moose and Abbotsford Heat, while also playing in the ECHL for the Victoria Salmon Kings. Brandt played four seasons and appeared in 130 games at the University of Wisconsin from 2003-04 to 2006-07, highlighted with the Badgers’ NCAA championship in 2006. We are excited that Andy has committed to be director of the program. There will be some changes to the way our classes will now be organized. Skaters will be grouped into 3 larger groups and then put into smaller classes within each of those groups. The goal for each skater now is to move from the Blue Group (Beginnners) to the White Group (intermediate) and on to the Red Group. Once a player reaches the Red Group, we will be encouraging them to then move on to the program that best suites their goal. Hockey, Speed Skating or Figure skating. 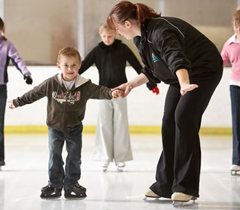 Our skating lessons are geared towards children. If you are looking for adult skating lessons please visit the Greater Green Bay Figure Skating Club's website. Skate rental will be available for $2 per individual class. We recommend dressing in warm clothing such as sweatpants, a sweatshirt, a light jacket, and mittens/gloves. We look forward to getting going with our new season in September! Session 1 is now full. Session 2 is now full. Session 3 is now full. Session 4 is now full. 4/8/19 Session 5 is now full!